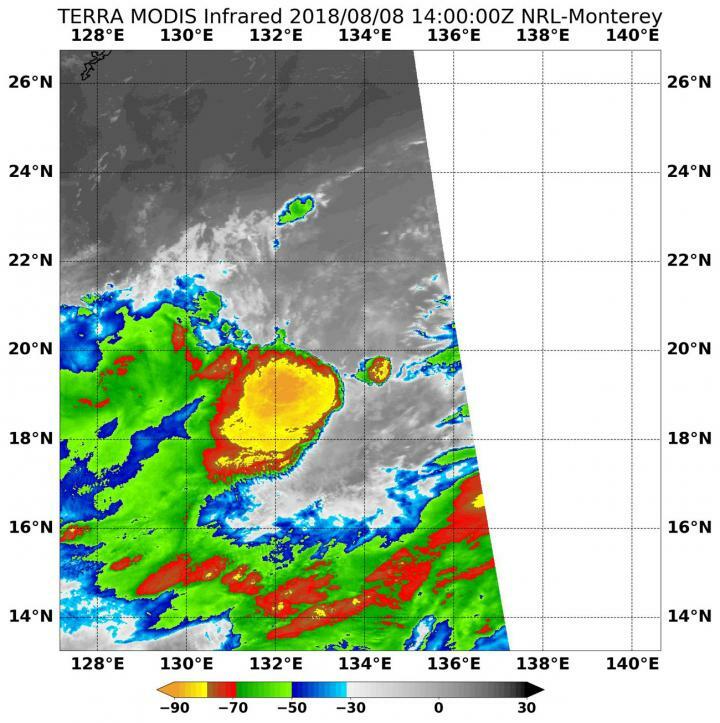 On Aug. 8 at 10:00 a.m. EDT (1440 UTC) the Moderate Resolution Imaging Spectroradiometer or MODIS instrument aboard NASA's Terra satellite analyzed Tropical Storm Yagi's cloud top temperatures in infrared light. MODIS found cloud top temperatures of strongest thunderstorms were as cold as or colder than minus 80 degrees Fahrenheit (minus 62.2 Celsius) west of the center. Those storms were being pushed from easterly vertical wind shear. Cloud top temperatures that cold indicate strong storms that have the capability to create heavy rain. The Joint Typhoon Warning Center said that "animated enhanced infrared satellite imagery depicts a defined, exposed low-level circulation center with deep convection sheared over the western semicircle. Another satellite image shows shallow banding wrapping into a broad low-level center." At 11 a.m. EDT (1500 UTC) on Aug. 8, the center of Tropical Storm Yagi was located near latitude 20.2 degrees north and longitude 134.0 degrees west. Yagi is located about 519 nautical miles southeast of Kadena Air Base, Okinawa, Japan. Yagi is moving to the northeast. Maximum sustained winds are near 35 knots (40 mph//62 kph). The Joint Typhoon Warning Center expects Yagi to briefly intensify before a weakening trend.